KUALA LUMPUR: ASUS’s groundbreaking new ZenBook Pro 15, a high-performance Windows 10 laptops for professionals, boasts a wide range of high performance features including its futuristic new Screen Pad — an ASUS innovation that revolutionises the way users work and interact with their laptop. 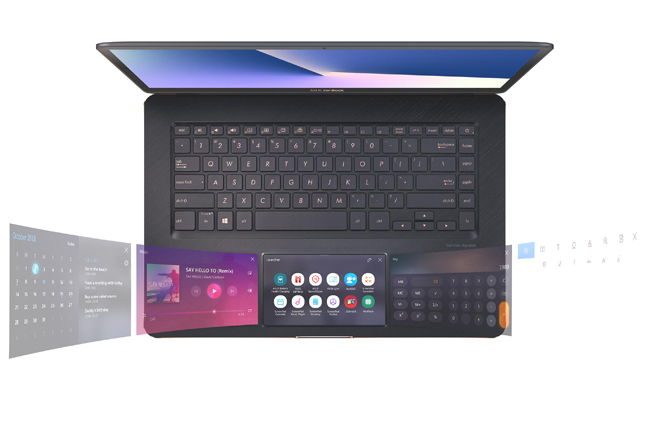 Launched in Malaysia’s market recently, the new ZenBook Pro 15’s Screen Pad cleverly combines a touchpad with a high-resolution, full-colour touchscreen to offer novel ways of interacting intelligently with both Windows apps and dedicated programmes called Screen Pad Apps. Adaptive functions with context-sensitive tools enhance workflow and productivity, and Screen Pad is fully customisable to allow users to personalise their experience. The new ZenBook Pro 15 offers class-leading performance in slim, and lightweight design. Powered by up to the latest 8th Generation Intel Core processors with up to 16GB RAM, gaming-grade NVIDIA discrete graphics, and the fastest PCIe 3.0 x4 SSDs, ZenBook Pro is designed to handle the most demanding tasks with ease. Comprehensive connectivity includes up to gigabit-class 802.11ac Wi-Fi, USB-C with Thunderbolt 3, USB 3.1 Gen 1 Type-A, and standard HDMI output. ZenBook Pro 15 also feature face recognition and built-in support for Amazon Alexai voice services. Users can also sign in effortlessly using just their face with Windows Hello, or enjoy hands-free control using Alexa’s voice recognition to get more done: hear the weather, listen to music, schedule appointments and more. Aside from that, the ZenBook Pro 15 with Screen Pad (UX580) is the first Screen Pad-enabled model in the series, featuring a 15-inch 4K UHD PANTONE Validated display, up to an Intel Core i9 processor and NVIDIA GeForce GTX 1050 Ti graphics. The Screen Pad is a Windows Precision Touchpad (PTP) combined with an interactive 5.5-inch FHD touchscreen that offers a revolutionary new way to work with a laptop. Another innovative form of adaptive Screen Pad integration is via browser extensions, such as the Screen Pad YouTube Player for Chrome. ZenBook Pro is designed for professional artists, designers, programmers, or any kind of creator who’s excited by new technology. Screen Pad also offers an exciting opportunity for developers to create new Screen Pad Apps or ways of integrating with desktop apps, delivering endless possibilities to users. It is also equipped with its 15-inch Nano Edge 4K UHD ultra slim-bezel touchscreen display. As well as displaying beautiful true-to-life colors from almost any angle, the stunning Nano Edge display is the key to ZenBook Pro 15’s incredibly compact footprint. Its ultra slim bezel gives allows the maximum amount of screen real estate in the minimum space, making ZenBook Pro 15 comparable in size to many 14-inch laptops. Aside from that, the ZenBook Pro 15 comes with a comprehensive set of high-performance I/O ports — including two USB-C ports with the latest Thunderbolt 3, two USB 3.1 Gen 1 Type-A ports and an HDMI port. The integrated gigabit-class dual-band 802.11ac Wi-Fi is capable of faster-than-wired speeds of up to 1734Mbps — 12 times faster than 802.11n — for smooth streaming of 4K UHD online videos, with greater range and more stable network connections. The new ZenBook Pro 15 is now available at leading local PC stores, with prices ranging from RM5,999 to RM10,999.